A long time ago, in a state not so far a way a group of intrepid bloggers visited Mythic HQ and got a look at Wrath of Heroes. During our talks with the developers, it was mentioned that we might be able to play some famous Warhammer characters in the game. It looks like that time is just about upon us. As an additional facet to the available Heroes, we will introduce some very special characters from the Warhammer Fantasy lore to Wrath of Heroes. You have probably heard of these very noteworthy persons and have read about their adventures. Now it’s up to you to lead them into batle and write a new chapter of their deeds. Not much else is known about them, except they will cost Gold. That's the in-game currency, so they will be free to play. And from the sounds of it, they could be expensive. Rankings. Last patch, they introduced a leaderboard/ranking system. It's not a traditional ELO type system, as scores just keep going up. As of this morning, the leader is a smidgen above 80,000 points. I'm not really sure how this system is sustainable. What will the leader be at in 6 months? I suppose they could implement a season system (like LoL) where the scores will reset. The winner get prizes in the form of cash, skins, in-game stuff and so on. That would be kinda cool. I'd still rather see a proper rating system put in, where you can lose points. Seems like the only way you can make skill matter in the rating scheme. This weekend I got bitten by the competitive bug. That lead me to playing League of Legends for most of my free time. I had recently reached 30, so was eligible to start ranked matches. I had a limited stable of champions, a single rune page, and experience in a few roles. I decided just to jump right in. When you start off ranked matches in LoL, you go through 10 placement matches before you receive your official ELO score. I managed to complete all 10, so am not a ranked player. I ended up going 4 - 6 and receiving an ELO rating of 1148. Sounds about right considering how prepared I was and that I hadn't played in a few weeks. Jungle. 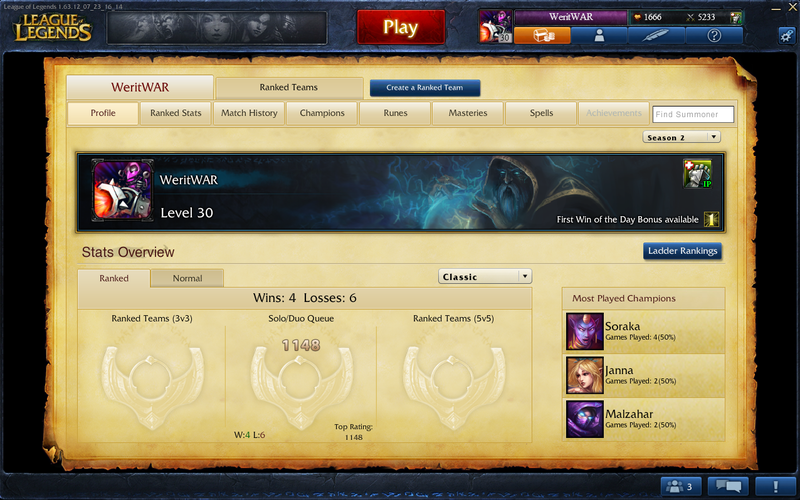 I really should do a couple of bot matches and learn how to jungle. Support. Support was actually popular in my games, led me to being Mid and Top. Soraka. She was a popular ban at this ELO. Runes. I really should complete my only Rune page. I have the IP, just being lazy. Zyra. She was a beast in one of our games, 24 kills. I tried to Exhaust her, but just ended up hitting Taric instead. Community. The games were surprisingly pleasant. I didn't need to report anyone. Some language difficulties, but overall not bad. I'm not sure I'll really spend a lot of time trying to raise my ELO, but I wanted to at least get there. Lots of games to play! This week, I have made some more improvements to my multi-MMO dev tracker, Dev Spy. 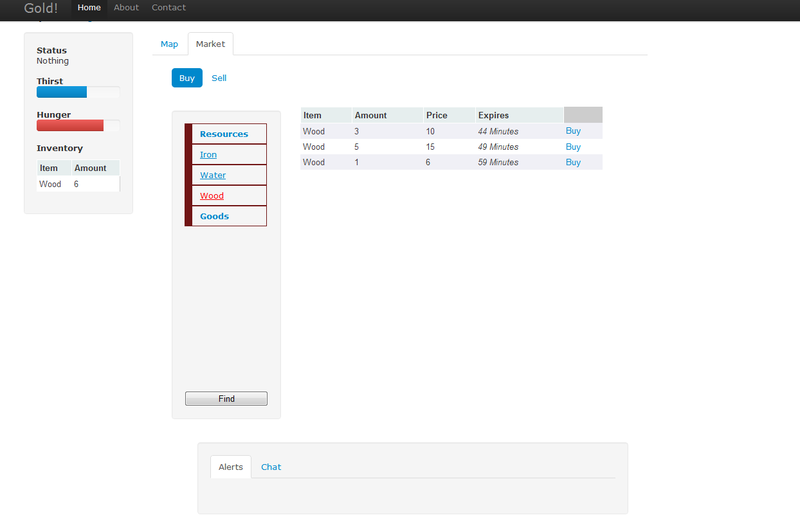 A good bit of the work was on the backend, but I added some more features to the site as well. The Secret World. Developer posts from the forums are now tracked! Check out the TSW tab to see them. New Games. I've added support for DC Universe (DCU) and End of Nations (EoN). Facebook. Dev Spy can now track a games Facebook updates. Currently, I have only enabled this for End of Nations, but will be adding other games soon. This is, of course, optional and can be disabled via the checkbox. Layout. I changed the way that the tabs look, they are now pills instead. I've also added scroll bars to the game list so I can support more games without having the page itself need to scroll. The Legacy system is one of my favorite features of Star Wars: The Old Republic. It does a really good job of making all of my characters feel connected, even if they are on different sides of the war. One area this can be seen is in their crafting system. The Trooper makes barrels for himself and companions, while his Scavenging skill is used to feed a number of other crew skills. The JK uses Cybertech to make Armoring Mods and general Mods for himself and all of my other characters and companions. I use mostly custom armor, so I need plenty of mods. Since the Trooper has Scavenging, he was free to take slicing instead and make a tidy profit. My next character will be an Imperial Agent. Even though he is on the Empire side, he fits in with my crafting organization. I love the fact you can send mail to characters in your legacy regardless of faction. Although, I would rather see a Legacy bank tab. Please BioWare, make that happen. The Imperial Agent will most likely take Armormech and mainly to craft Custom gear since I have a load of schematics. I don't really need any regular armor anymore since I've committed myself to using the much more flexible custom items. I'm tempted to pickup Biochem instead for PvP, but looking good is always a priority. Eventually I hope to have all crew skills so my little SWTOR organization can be self-sufficient. 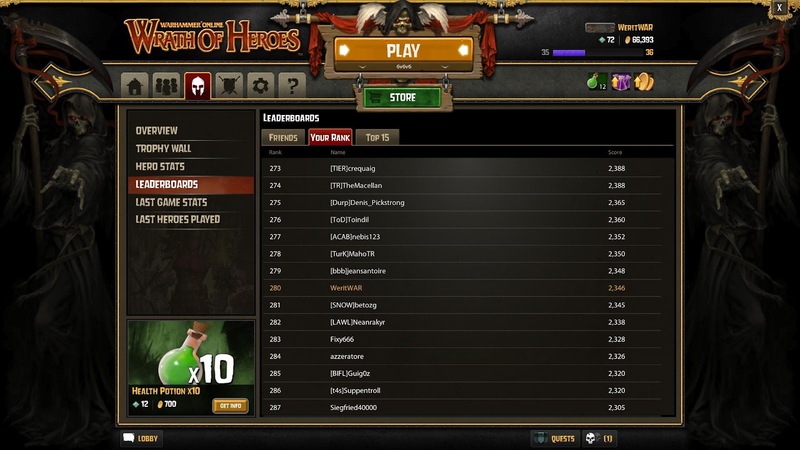 Included in yesterdays patch, a new ranking system was introduced for Wrath of Heroes. I have always felt something was lacking with WoH, mainly 'what's the point?' Competition is a great way to fill that void. Does the ranking system accomplish that feat? Everyone starts off fresh as far as rankings go, so I logged on and played a bunch of games. A player’s score for rankings is based on their gameplay and analyzes personal and team gameplay. Scores will only go up, at a rate determined by the player’s performance, but rankings will vary based on other players’ performance. This makes the system seem much more like a cumulative High-Score board rather than a competitive ranking system. The people who play the most will top the charts rather than the ones who play the best. That is pretty disappointing for those hoping for a competitive measure, unless I am mistaken. I'll never be able to play as much as some other people, so I will perpetually be ranked low even if I win and play well. I hope that Mythic reconsiders the system and adds a more competitive mode. 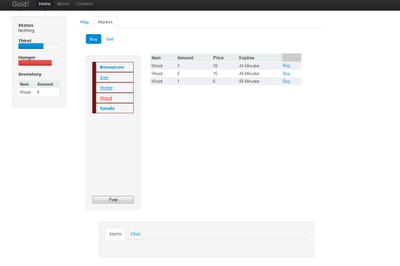 My side project, tentatively named Pioneer, is progressing nicely. I've recently added an important game system, the Market. If you have played a MMO before, it's basically an Auction House, minus the auction aspect. So, very similar to WAR and SWTOR in that regard. I had considered going with a buy and sell order system like Eve Online has, but decided it was not really necessary for this project. 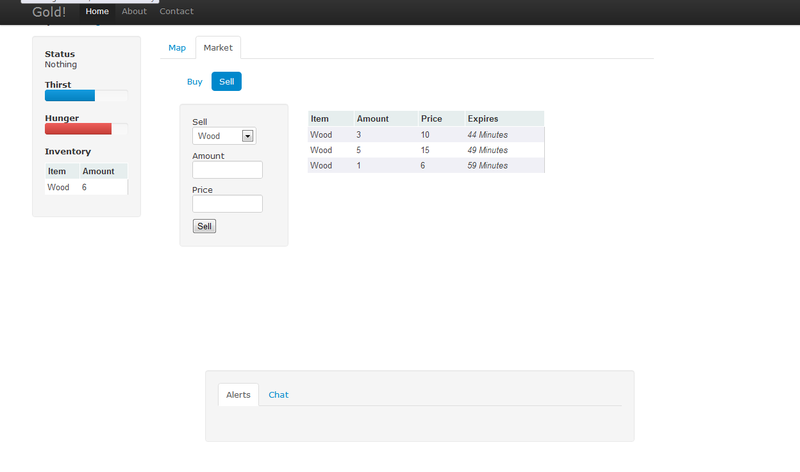 I have it coded up already for others though, so plugging it in is mostly a matter of interface changes. To use the Market, your character must be in a hex that has one. Like everything in the game, markets will be built by the players. Those who build them will get a cut of the profits. Long ago, before the days of Warhammer Online, I used to play Lord of the Rings Online. In fact, most of my time was spent in their world pvp area ( Ettenmoors ). I had a great time too, but there was always a problem. LoTRO is a PvE game at heart. PvP will always be an afterthought, so I went looking for a game where PvP was the focus. 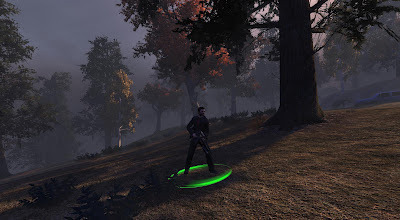 Life goes on in LoTRO and they are making some pretty big changes to the Moors in the Riders of Rohan expansion. The Dev Diary discussing the changes is pretty big, so go read through it if you want to take up some time. The changes can be boiled down to a single statement: In order to get your rewards someone has to die. It's a simple statement, but a powerful one. No longer will take objectives give the player any kind of reward. Instead, they will grant buffs to the holding side which increase the rewards from killing other players. The downside to this philosophy is population balance. If that is out of whack, there will not be enough enemies to kill, or you'll be too outnumbered to get enough kills. I do think it is the way to go though, there is not much worse than seeing objectives flipped and players hop to the other side and repeat. Since SWTOR's 1.3 patch, I have been working on an in-game project. The goal: Earn 1 million credits by playing the Auction House. I'm happy to say that I reached this goal a couple of weeks ago. It turned out to be pretty quick and painless too. This was all done on my level 31 Jedi Knight (I still don't have a 50). The basic idea is just to buy low and sell high. The other big money-maker is the Slicing crew skill. Crew Missions are very valuable, especially Slicing ones due to the new patch. There are a few other items you can buy and sell, but I'll leave that as an exercise to the reader. One million credits really is not all that much if you look at some of the legacy prices, but it is nice to have going forward. Not sure I am going to try for 2 million, might wait for the next patch. Yesterday, BioWare released a trailer for their upcoming SWTOR companion character HK-51. This HK unit is a newer model of the infamous HK-47 from Knights of the Old Republic. I dare say he was one of the most entertaining video game characters ever created. In the post, they say HK-51 is coming 'very soon.' I'm thinking that means he will be a part of the 1.4 patch. There is also a new world event coming up which focuses on finding some stuff too, so could that be a lead in to the HK-51 quest line? I have returned from my pseudo-vacation. It turned out to be a pretty lame weak, as I was under the weather most of the time. On the positive side, I did get ample time to catch up on TV and gaming. I did more of the first though with a lot of time watching Psych Season 1. SWTOR. My Trooper is still on Hoth. Most of my time has been spent on my Jedi Knight doing another project, which I will discuss a bit tomorrow. TSW. I'm still in Kingsmouth. I'm not sure how some people advance so quickly, there is so much to do here. I currently have 31 AP to spend but am in no rush. My current skills seem to do the job just fine. Thrawn Trilogy. I started to read the Thrawn Trilogy (Star Wars). I don't know why it has taken me so long to get into the Star Wars Expanded universe, but better late than never right? Development. I'm still working away on my latest game idea. I just do a little piece each day. Most of my recent work has been on the Auction house. I'm pretty much on vacation this week. That has meant free time for development, yay! Just a quick post today. 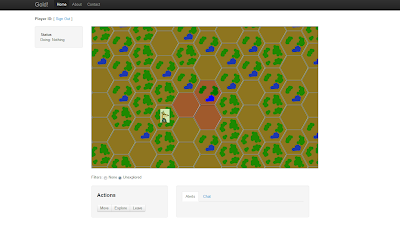 I hooked up a 'fog of war' system for tiles that you have explored. Explore is an action, which lets you find items and uncover resources. What limits should be placed on player activities? Activities being actions they take in game, like moving, building and so on. I've come up with threee options. No Limits. This would be akin to the common MMO. Players can log-in and do whatever they want for how long they want. Usually it ends up being a mix of grinding and waiting. For my project, I don't really think this is a feasible approach. The game would would have to be enormous. There would also have to be a lot more to do than I could possibly provide. Resources. With this model, players would have a pool of 'action points' which are spent doing things in the game. Once exhausted, the player would have to wait until they get a new allotment or they can purchase more from a store. This one seems to be pretty common among free to play games. I am not really a fan of it though. It seems too focused on player purchases than gameplay. Time. Every action takes X amount of time to complete. 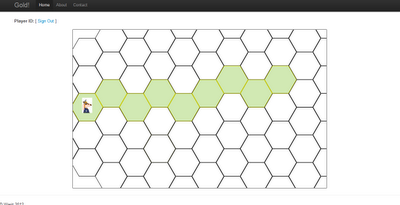 For example, it may take 30 seconds to travel from one hex to another. This is the option I have implemented so far. I'm not a huge fan of making players wait, but this seems like the least intrusive. I can also provide tools, like pathing, that let players queue up actions for when they log off or do something else. So right now, it looks like option #3. Did I miss some better ways of handling the problem? One of the things I like about The Secret War is its modern setting. It's nice to be wearing something familiar, rather than chain-mail and a cod piece. TSW has a wide array of clothing to choose from, so yesterday I did a little shopping. I hopped on the Agartha and headed back to London. There I found the Men's Business Attire vendor and bought myself a suit. No reason I can't look good while killing the undead. So I got my suit... but a shirt and tie was no where to be found. It turns out that they are only available in the cash shop. Sigh. I'm paying a subscription, and to complete this look I need to give them even more money. This is the first real disappointment I have had with the game. Anyway, I decided to try the store out since they had a $5 worth of tokens option. It worked fine, no issues getting my shirt. I really don't see myself using the cash shop again though. One good thing Funcom did is make sure the store contained cosmetic items only. Now that I have a good look, I don't think I'll need to buy anything else. If I do want a change of pace, I believe there are faction rewards I can wear instead. You know, I still don't know what to make of The Secret World. I played a healthy amount over the weekend and am still undecided. My Templar (Werit) is still doing work around downtown Kingsmouth. For a small general area, there is a ton of stuff to do. I have a load of AP, which I dumped all into Assault Rifles. I still have 8 or so left to spend, but that will go into the Support category for Assault Rifles. Thanks to some kind readers on Bio Break, I learned that I could equip more than one weapon with the Assault Rifle. I had a preconceived notion that it was a 2h weapon. I also learned about Decks and figured Soldier would be a good goal to work towards as I learned the system. It also looks like it provides a nice clothing reward once you complete it. Crafting has been a bit tedious so far, but I am just learning about it. Splitting stacks and placing them so they form a shape is not really doing it for me. My time over the last day or so has been spent on the Kingsmouth Code investigation quest. It has been challenging, mainly due to being trained by countless games that came before not to think. As my mind bends toward the TSW way of doing things, it started to get a little easier. I still needed to use Google for one step though, and the Help channel. You know what is starting to get old? Walking around town and aggro-ing zombies. Just leave me alone, you can't kill me. I'll admit it, I've died just so I can rez closer to where I want to go. I've also noticed, at least at the stage of the game where I am, that the whole Faction element is absent. Right now it feels like just a label and does not add any flavor to the gameplay. Maybe that will change as I progress through the main quest, we'll see. It is certainly an interesting game. I still don't know if I will play beyond my first 30 days.